"The play's premise is an ingenious one." The scene: Chawton Great House, Hampshire, England—home of Jane Austen’s brother, Edward Austen Knight. The time: December 1815, on the eve of the publication of Emma. The plot: In the tradition of home theatricals held during her childhood at Steventon rectory, Jane Austen has prepared an entertainment for her family in which her siblings are to take part with her as performers. 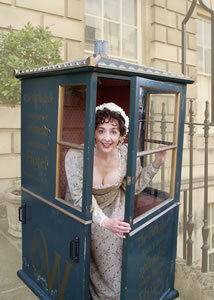 She expects to begin playing Mrs. Bennet (from Pride and Prejudice), to her brother James’s Mr. Bennet. But her family has played a trick on her: they have left Jane to tackle an unrehearsed solo performance. They provide her with a list of topics quizzing her on her life, her writing, and the inspiration behind her work. These serve as the springboard for a most enjoyable evening, filled with Jane’s pointed observations on her family, friends, suitors, and society, as well as her own hilarious early efforts as an author. Love Arm'd Productions - Karen Eterovich. © Copyright 2007 Karen Eterovich. All Rights Reserved. Design by Eric Armstrong.